Mike Mussina's been stinking up the joint lately, as you probably already know. Monday's 16-0 drubbing at the paws hands of the Detroit Tigers was only the latest exhibit in the case against Mussina's still belonging in a major league rotation. The evidence in that case, it appears, is building up faster than they could pile up bloody gloves and DNA reports in the O.J. case, but Simpson is currently "looking for the real killers" at book signings and golf courses all over the U.S., so maybe Moose still has a chance to avoid the virtual lynching being perpetrated upon him by some of my colleagues in the blogosphere. Exhibit A: Mussina's been teetering on the brink of useless all season. Mussina is no longer the pitcher whose knuckle curve, funky delivery and low-90's heat could win games in a number of different ways. He's now almost 39 years old, and never had an "overpowering" fastball to begin with. His control is still there, at least in terms of avoiding walks (he walked 2.11 batters per 9 IP this year, and his career mark is 2.02), but he's not striking batters out very much. 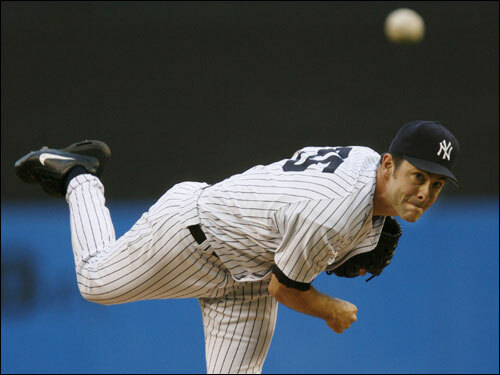 When Mussina first came to the Yankees as a free agent in 2001, he struck out 8.42 batters per nine innings, the second best mark of his career, at age 32. Two years later, it was still as high as 8.18. With his nagging injuries in 2004-05, he was down to a little over 7 per 9 innings, which is still quite good, and he jumped up to 7.84 last year, when he made 32 starts and totaled almost 200 innings. Exhibit B: I haven't once seen him pitch this year and thought that he really looked good. He's only got 11 "Quality Starts" in his 23 games this season, and four of those just barely meet the 6-inning, 3 Earned Runs criteria for that stat, which is little more than a benchmark for mediocrity anyway. If Mussina can't even do that half the time, what business does he have pitching in the majors at all? Let alone making $11 million to do it. Exhibit C: And this, even though Torre's handled him with kid gloves. He hasn't thrown more than 98 pitches in an outing since June 24th. Even in games where he's been effective, Torre has taken him out a little earlier than you would think for a 17-year veteran with almost 250 career victories. Perhaps Joe is trying to save him for the playoffs, or get the young guys some work, or maybe he just wants Moose to be able to go into the clubhouse knowing that he did something right, so he'll have some confidence on which his psyche can build next time. You wouldn't think that you should have to pamper such a grizzled veteran, but who knows? How bad is Mussina? At the moment, there are about 101 pitchers in the majors who have pitched at least 120 innings (Moose has 124) this year. Mussina's 5.53 ERA ranks 96th among those 101. He's 8-10 only because the Yankees are, well, the Yankees, and they score 5.6 runs per game when he pitches. On a mediocre team, he'd be 5-13. On a bad team, if he had pitched more, he might be flirting with 20 losses. Yeah, he's been that bad. However, there is some reason to hope. According to ESPN, Mussina's defense-independent pitching ERA is only 4.14, about 75% of his actual ERA, which is the lowest ratio in the majors (among the 101 pitchers with that many innings). Baseball prospectus indicates that the Yankees' Defensive Efficiency, the rate at which balls in play are turned into outs (or the complement of batting average on balls in play) as a team is .692, which ranks 19th in the majors. They were 3rd last year. In other words, opposing teams have hit .308 against the Yankees when they've put the ball in play, i.e. on pitches that don't end in walks, homers, whiffs, hit batsmen, etc., notably worse than the MLB average, which is about .300. For an individual player, the difference of .008 points in batting average is almost negligible, fewer than 5 hits over the course of a season if you get 600 at-bats, less than one per month. For balls in play, which typically are more like 450 at-bats, we're talking about 3.5 hits. But for a whole team, with about 4,500 at-bats that result in a ball in play, that paltry .008 difference in batting average means about 35 more hits per year. Unfortunately, it gets even worse for Moose. Opposing batters have hit .348 against him this year when they've put the ball in play, which is the highest opponent balls-in-play average in the majors. (Overall, opponents have hit .313 against him this year, the second highest in the majors among pitchers with at least 120 innings pitched.) And we're not talking about errors here. Those are not the main culprit. The Yankees' team .986 fielding percentage and 70 total errors are both 7th best in the major leagues. Indeed, Mussina's only had two batters reach base on an error all year, and has allowed only three unearned runs, so it's certainly not that. It's just that the balls that Moose allows into play are not getting fielded, either because luck lands them where they ain't, as Wee Willie Keeler used to say, or because the Yankee defenders aren't good enough at getting to where the balls are. Historically, it seems that Moose has had pretty hittable stuff for quite a while now. Last year's apparent resurgence, that full-run drop in ERA, was mostly due to the fact that his bad luck (and/or porous defense) from the previous few years had reversed itself, at least temporarily. This year's atrocious performance, it seems, is largely attributable to the re-reversal of that trend, so that now it's worse than ever. In short, Mussina's been sabotaged by his defense's inability to do their jobs more than anyone in the majors this year. Not that it's all their fault. "Luck is the residue of design," according to a man who built World Series contenders in three different cities. You notice how Mussina's ERA changed significantly from 2001 to 2002 to 2003, despite the fact that his BABIP was almost exactly the same? That's because his strikeout rate dropped in 2002, then went back up a bit in 2003. If you noticed on the BABIP list I linked to, among the other pitchers with high BABIP numbers were Scott Kazmir and King Felix Hernandez, who are considered two of the rising young stars of the American League. They both have winning records and ERAs below 4.00, in spite of their high BABIP numbers, because with all those strikeouts, they hardly ever allow a ball in play. Matt DeSalvo: 8-5, 2.82 ERA for Scranton, but almost a walk every other inning, and got hammerred when he was in the majors back in May. Not the answer. Steven White: 6-4, 3.62 ERA in Tampa and (mostly) Scranton. Doesn't walk so many as DeSalvo, but doesn't strike out a lot of batters either. His best talent is preventing homers (only one every 14 innings or so in the minors) but that probably won't be enough. Has never pitched in the majors. Jeff Karstens: Looked good in his last two starts (11 IP, 4 ER, 3 BB, 5 K), but has had only three outings after coming back from the broken leg, and didn't strike out a batter in 5 innings last night. Probably needs more time. And maybe a fastball. Kei Igawa: I know, you don't want to hear it. You wish we'd never spent that $50+ million to get him here, but he's here, and the fact is that he's been decent in AAA the last few times out. He's had three out of four Quality Starts, and more important, he's walked only 3 batters in 25+ innings in those 4 starts, while striking out 24. This may be the answer. Ian Kennedy: Has blown through three levels of the minors this year, going 12-3 with a combined 1.91 ERA and 163 strikeouts in 146 innings in A, AA and AAA. Only has 34 innings of experience above AA in his career, so you would think that it's probably too early to throw him into the heat of a major league pennant race, but apparently the Yankees don't agree. They'll bring him up to pitch in Mussina's spot on Saturday, at which point, he will not have pitched for a week. Personally, I would have gone with Joba Chamberlain, who was a very effective starter in the minors before he came up to the majors, but I guess they're trying to keep his 21-year old arm fresh, so they don't want to have him starting and logging lots of innings in the majors. In the meantime, I guess Moose will get mop-up duty until Torre's confidence is restored or until enough of the other starters suffer injuries that Joe has no choice but to give Mussina his job back.